A face with round eyes and long oval mouth with teeth bearing down. Both upper and lower teeth are shown. 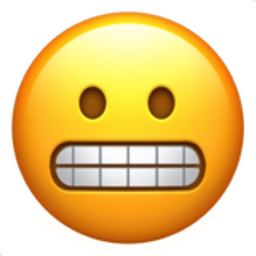 It's hard to tell if this emoji is in pain, growling or simply disgusted. If this emoji was a new born baby, its "G" APGAR score would undoubtedly be the highest score of 2.